Jeremy N. Foley, who has handled virtually every aspect of the University of Florida’s $119.3 million athletic program during his athletic administrative career – which began with an internship in the Gator Ticket Office in 1976 – will retire as AD on October 1, 2016. 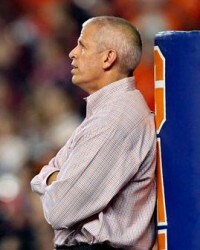 He has served as UF’s Director of Athletics since March of 1992. Florida has been equally successful on the field of play and in the classroom during Foley’s administrative tenure. The Florida athletic program has ranked among the nation’s top 10 for 33-straight years (1983-84 – 2015-16) and among the top five for 18 of the last 25 years, according to national all-sport rankings. Florida was among the nation’s top five schools in each of the last eight years, including three straight runner-up finishes from 2011-12 – 2013-14. Florida was the first school to win the Capital One Cup in both the men’s and the women’s competition since the Cup was introduced in the 2010-11 season. Foley is the only athletic director in Division I history to supervise a program that has won multiple national titles in football (1996, 2006, 2008) and men’s basketball (2006, 2007). Overall, 27 UF teams have been crowned national champions under his watch.